Dr. Arta Farahmand, Torrance, CA periodontist, held a successful Hygiene Study Club on how to diagnose and perform a risk assessment on teeth affected by periodontal disease. Skilled and experienced in regenerating lost tissue, Dr. Farahmand instructed her latest Hygiene Study Club on not only how to perform a risk assessment of teeth affected by periodontal disease, but how best to treat them as well. Acclaimed periodontist in Torrance, CA, Dr. Arta Farahmand, recently spoke at her latest Hygiene Study Club event. A difficult feat to accomplish, attendees learned how to determine the longevity of a tooth and predict the progression of periodontal disease. Dr. Farahmand also instructed hygienists and dentists in attendance how to save these affected teeth by combining innovative bone grafting techniques and platelet-derived growth factors. Periodontal disease, if left untreated, can cause periodontal pockets, gum recession and even bone loss. If bone loss progresses, it could affect the security of a tooth and lead to tooth loss. Skilled and experienced in regenerating lost tissue, Dr. Farahmand instructed her latest Hygiene Study Club on not only how to perform a risk assessment of teeth affected by periodontal disease, but how best to treat them as well. A member of the Academy of Osseointegration and leader in bone grafting techniques, Dr. Farahmand combines bone grafts with platelet-derived growth factors and plasma rich fibrin for enhanced healing. A trusted periodontist, she also understands the importance of proper periodontal disease treatment from the start and encourages patients with signs of this harmful disease to visit her office for a consultation. 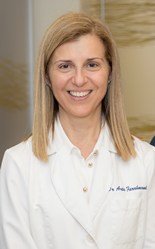 A frequent speaker on periodontal conditions and treatments, Dr. Farahmand recently announced the dates for her 2019 Advanced Esthetics and Comprehensive Study Club. Comprised of four sessions, this respected study club is focused on the interdisciplinary collaboration for enhanced treatment planning of complex cases. This study club breaks open this topic with its first session on January 29, 2019. Clinicians interested in attending Dr. Farahmand’s upcoming study club can call 424-488-7500 for more information. New and existing patients with loose teeth, bleeding gums or other signs of periodontal disease are highly encouraged to schedule a consultation by calling or visiting http://www.periodentalimplants.com.